Here are the decoys at work. Going to show this off real quick so people know how unshielded archer decoys / chaff actually work. The first enemy volley hits the Markata hard, and the rout immediately. 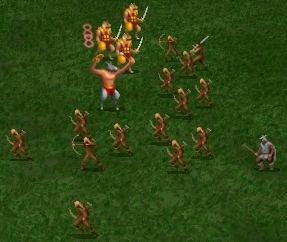 The Atavi survive until they engage with the Wolf Tribe Warriors, who dual-wield daggers. Then rout after one round of enemy melee. 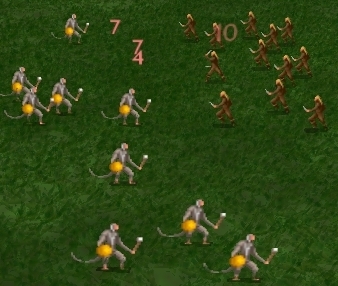 This buys enough rounds for the demons to be blessed and close, and they rout the Warriors in one round, then chase down the Archers. 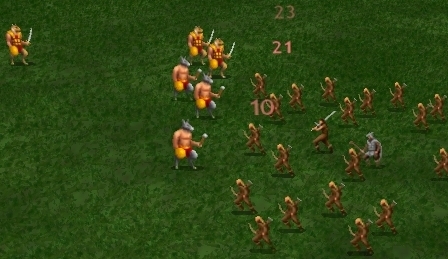 But the Wolf Tribe Archers are tougher in melee than expected, and manage to kill 3 sacreds before fleeing. As there is only one retreat route, the routed units all end up back at the capitol. 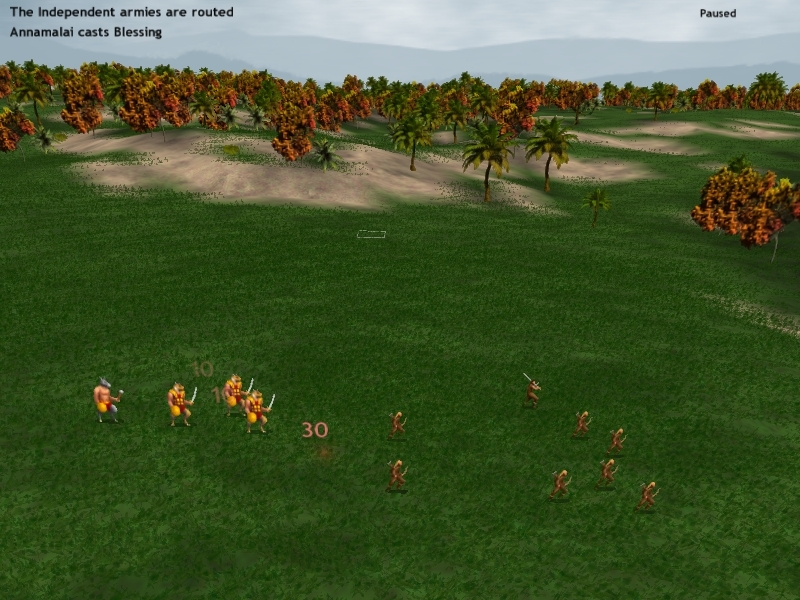 In terms of absorbing arrows, the decoys did their job, but the battle was still close. 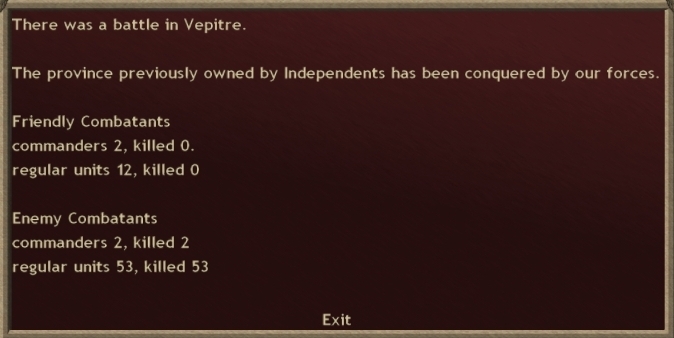 There's enemy dominion in the southern province, which is extremely disturbing. Up north is T'ien Ch'i, who worship The Biggest Poppa, played by Feinne. I don't know much about Feinne as a player. Feinne updates and administers the FF mod, which is a balance mod based on the combination of the latest CBM, AG, and AE. Modders usually have fairly good understanding of game mechanics, by necessity. TC however, is a "weaker" nation of the 7 we have here, having human troops instead of demons or giants or monsters. Their sacreds are dangerous having high attack and multiple attacks (good vs def stackers like my water bless), but unshielded and therefore archer-vulnerable. 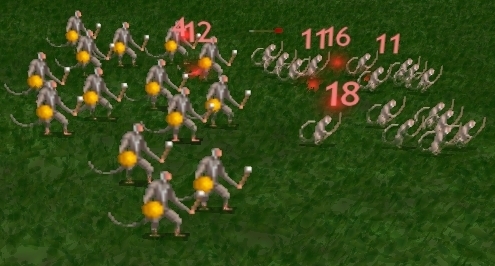 Pisachas and Ganas are monkey undead, vulnerable to Banish spam. 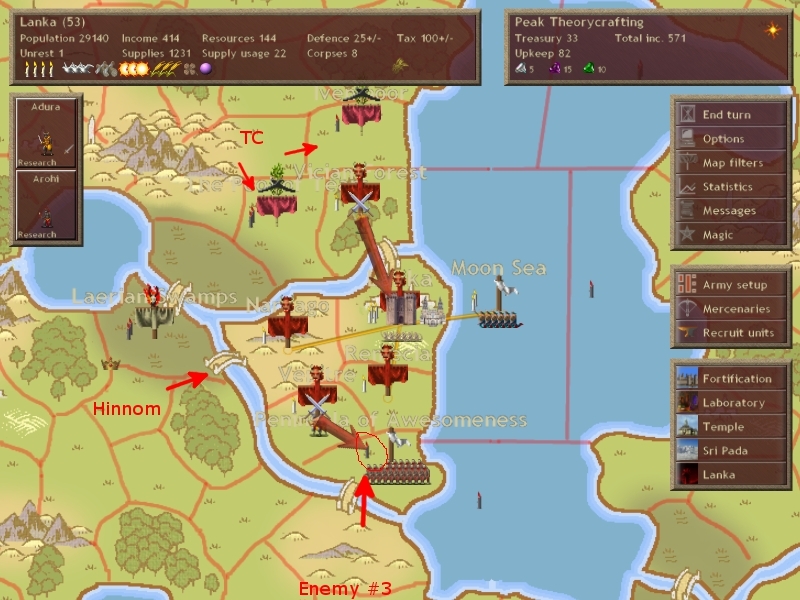 The province contains no ranged units, so I change the formation to put my priests in Banish range and redo the scripting for fighting undead. Next turn: What's in a start position?